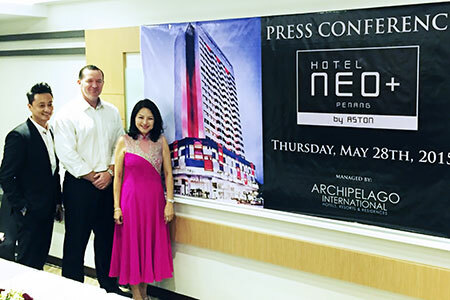 Malaysia, May 29th 2015 – Archipelago International celebrates the Grand Opening of its first NEO hotel outside of Indonesia - Hotel NEO Penang - Malaysia. The commemorative event is being graced by a number of VIP guests such as the Chief Minister of Penang - Mr. Lim Guan Eng, the Executive Council of Penang, representatives from the State Tourism Development & Culture department, and other key industry players. Since the NEO brand is arriving in Malaysia from Indonesia, the event is featuring an Indonesian theme, complete with a special menu of local and Indonesian cuisines. Hotel NEO Penang - Malaysia soft opened on the 14th February 2015. It is located on Gurdwara Road in Georgetown, “the Pearl of the Orient's city” - a town famous for its culinary fanfare and idyllic beaches. Setting the pace for business travellers and holiday makers alike, the hotel is within walking distance to the famous New Lane Hawker Centre as well as to the 7th Street Market or more popularly known as Chit Tiau Lor Ban San. Those interested in arts & culture will also be pleased to know that the hotel is located just opposite the Hin Bus Depot Art Centre. In addition, Hotel NEO Penang - Malaysia is also in close proximity to the popular Penang Street Art designs located at the UNESCO World Heritage sites such as Armenian Street and Ah Queen Street. For those who would like to indulge in Penang’s unique living heritage would be happy to note that Neo is also about a short 10 minutes’ drive to the Clan Jetties such as the Chew Clan Jetty and Lee Clan Jetty. For the savvy business travellers, the hotel is approximately 400 meters away from KOMTAR where the government and corporate offices are currently located and just 30 minutes from Penang International Airport. Hotel NEO Penang - Malaysia holds 196 guest rooms and suites with a modern and contemporary style befitting the new trends in hotel design. It offers uncluttered open space that creates an atmosphere of relaxation and revitalization in a trendy but reasonably priced environment. Rooms are well equipped with high-quality beds and pillows, free high-speed Wi-Fi, LED TVs with international & local channels, home entertainment systems, tea and coffee makers and a writing desk with universal electrical outlets, whilst the bathrooms come with large standing showers, fluffy cotton towels and complimentary bathroom amenities. Bringing Hotel NEO's trademark experience to Malaysia and staying truthful to the groups' credo that well designed and exciting hotels do not need to be expensive, the hotel offers a full set of amenities in every room and up-market facilities throughout. Hotel NEO Penang - Malaysia also features 4 meeting rooms, 2 function rooms, a swimming pool & gym, as well as a lounge & bar for private events, weddings, meetings, and exhibitions. NEO hotels also stand out as Indonesia’s first and only 100% non-smoking select service hotels – a feature that shall also grace NEO's Malaysian portfolio. “As Indonesia's fastest growing hotel management group, we at Archipelago International are absolutely delighted to be expanding our NEO brand to Malaysia for the first time. Not only does this mark another fantastic milestone in the Archipelago history book, it's also a great milestone for our NEO brand and proof of its success thus far.” Said Mr. John Flood, President and CEO of Archipelago International. Seen in the image - Left to Right : Mr. Melvin Ooi as General Manager of Hotel NEO Penang - Malaysia, Mr. John Flood as President & CEO of Archipelago International and Mrs. Sharon Ooi – Board of Director of Hotel NEO Penang - Malaysia during the Press Conference. 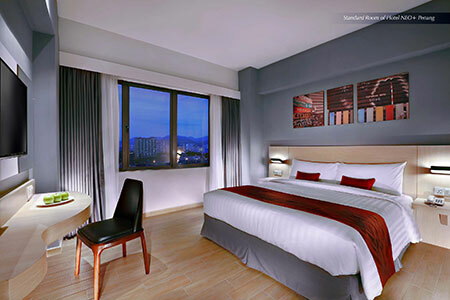 Seen in the image : Standard Room of Hotel NEO Penang - Malaysia. Archipelago International brands include: favehotel, NEO, Quest, Harper, Aston, Alana and Kamuela. Archipelago International’s properties range from ultra-luxurious villas with private pools to select-service, economy-class hotels to serviced-apartment residences, thus offering Indonesia’s largest and most comprehensive hospitality network.